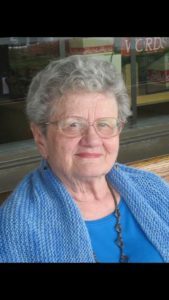 For those readers who don’t know, my mother, Lillian Applegate Westfelt, the Lillian in “Lillian’s Cupboard,” passed away on November 11, 2018. I wanted to make an announcement post before this but just couldn’t face it. Now, with the old year running out, I thought it was a good time to pay tribute to a great woman. We’re hoping to leave Mom’s blog up indefinitely. It’s a wonderful archive of information, recipes, and memories; a true legacy as well as a fitting tribute to who “Lillian” was and what she cared about. If you’re here only for the recipes or the quilting, someday take some time to read her memoir posts about life in the 30s and 40s and as a young mother in the 50s and 60s. She also was a tireless chronicler of life as it happened. If I ever need a refresher about a birthday celebration, holiday, or other event, I know I can go to this blog and relive the whole thing. The day after she died, I posted a tribute to her on my own blog here and more about that night here. Frankly, we’re still reeling. We had a good Christmas, though, which would have made Mom happy. She insisted we go on celebrating no matter what and not become morose or bitter when she was gone. She adored Christmas. To all her readers and followers, thank you for supporting her over time. She valued each and every one of you. Even though she slowed down in her blogging over the past year, she remained dedicated to it. There’s a wealth of reading on “Lillian’s Cupboard.” I hope you’ll stop back now and then to relive special moments in a long and happy life. Thank you for letting us followers know of the loss of your mother. I too, lost my mother suddenly, so I know the depth of your pain. May God Bless you and your family. Nancy, I am so terribly sorry! I will miss her. Your mother’s blog is one of the first I clicked onto, mainly because she had my late mother’s name. I told her as much and followed her ever since. That was 6 1/2 years ago, give or take. I loved her posts and grew to love her too. Thank you for leaving her site up, I will need to print out some of her posts – we always think we have plenty time….. I am so sorry to know of your Dear Mother’s passing. I have followed her for many years. May the peace of the Lord be with Lillian’s entire family at this most difficult time. I am so sorry for your loss. I have enjoyed here posts, recipes and stories. What a blessing to have her. Hugs. I am so sad that she is gone. She has been on my feed for a number of years. I loved learning about her life and how it related some what to that of my mother who passed away in 1999 way to soon. My thoughts and prayers will be with you. How fortunate for you to have had such an amazing mother. While I never met Lillian, she was counted as a friend. She was so good to visit my little blog and was my very first follower. She left such kind comments and suggestions. Thank you for sharing her and her wisdom with us. I have already come back several times, and I know I often will stop by. I realized when I was writing something a couple of weeks ago on a private history blog that Lillian could read (and my sons), that she wasn’t going to be reading it or leaving a sweet comment, and I almost didn’t write it. I miss her a lot. She was all you’ve said and more. As a friend it is hard, so I know as a daughter it’s been even more difficult. I’m glad you had a good Christmas. I thought about you, and hoped you were. You knew your mom so well, I imagine you could hear her comments about things as you went about Christmas Day. 2019 will be a different year, but I hope you find the happiness it offers, just as your mother always did. I only recently found your mom’s blog and I don’t remember how that happened. Thank you for leaving the blog up so we can read it and use her recipes. I had only begun to scroll through reading and will enjoy going back through it to see what all is here. This is hard for you and your family I’m sure – I have been there loosing my mom just 4 years ago and dad way before his time – it takes time – it will be nice for you to be able to go back and read her stories I’m sure. I will miss your mother’s blogging, especially her stories (some of which kindled memories of my own, me being 80). I’ve also tried a couple recipes and saved more for later. Thank you for letting us know. Take care of yourself and indulge your memories. I am so sorry to hear of your mother’s passing. I always marvelled how she embraced technology and kept her blog. I always looked forward to getting that email that Lillian had posted a new blog. She touched my life and I am sure many other readers as well. Vale dear Lillian. A beautiful woman: inspiring, talented, compassionate, and so very intelligient. Lillian’s posts were magnificently crafted, such a gifted writer. The historical posts were a privilege to read – I envied your family…such love and happy times. Your mother shared herself freely and for that, I and her other readers are blessed. Please accept my most loving and sincere condolences. Nancy; I am so sorry for you girls loss, rest assured God is celebrating his gain. Your mother was the perfect example of a wonderful mom. She will be shurely missed. I am so deeply sorry and sad to hear this. My heart goes out to you and your family. Lillian was a genuine and sweet person. She was a great blogger friend. I enjoyed our comments back and forth in our blogs. I miss her, but am happy to hear that this blog will be up for us all. To echo the others, this is a great tribute to an amazing woman. I was always inspired by her and her love for learning. Wonderful person! I always talked to her when she was walking her dog. She will be missed. I am so sorry to hear this. I have followed her since I started blogging 10 years ago. She was always good about giving likes. Her writings was so interesting and originally I would binge read them. I just canned one of her recipes for corn relish and will post it in memory of her. We will miss her also. I’m so sorry to hear of your Mom’s passing. I enjoyed all of her posts. Her recipes are wonderful! She had such a giving spirit. I thought it was so lovely that she knitted so many scarves, hats and mittens to donate to children and adults. Sending hugs and prayers to all of her family and friends! I checked several times in recent weeks for a new blog post and was concerned that Lillian might be unwell. Her zest for life and her continued devotion to making and baking will remain an inspiration. So sorry to read about your mom’s passing. She was a very loving mother and a woman of many talents. I will miss her blog and her wonderful recipes. This is such sad news! I have adored this blog and loved Lillian’s writing style. I gave it any number of shout outs on my blog. She accomplished so much and was an inspiration to me. Thank you for keeping the blog up as I will want to keep visiting. Take care. I am so sorry to hear that Lillian has passed away. I’ve always enjoyed reading her blog, and have a link to it on my blog’s sidebar. I haven’t been active on my blog for quite sometime, and only saw today that Lillian is gone. I will miss seeing her new posts, but I’ll surely enjoy some of her older ones. Rest in peace Lillian. I’d like to extend my sympathy. I enjoyed getting to know your mother via our blogs. I loved her recipes and still make her potato and cauliflower soup. However, my favorite posts were her memory posts. The photographs and stories were wonderful. She will be very much missed but not forgotten. I am glad that you have decided to leave her blog up. Oh no. I am so sorry to hear this. I haven’t been reading or writing blogs for some time. Lillian was such a lovely woman and a good online friend. She meant so much to me over the years and I’ll cherish our correspondence through some difficult times. She will be so very missed. I’m truly sorry for your loss. i only came across this blog recently. From what I’ve read she was an amazing woman & you have been truly blessed to have her as your mom. God surely shined upon your life! i am so sorry for your loss! I pray that you can celebrate the wonderful life you shared with her and she shared with so many others. She is still sharing smiles and goodness around the world because her blog is still here. Thank you for continuing the sharing of her legacy. i feel truly blessed it came across my path! God Bless!